The story of the notorious twin gangsters Reggie and Ronnie Kray was previously told in a 1990 movie called The Kray's . The colorful duo ran the underworld of London with their history of robberies, arson, protection rackets, assaults and murders. This new film directed and written by Brian Helgeland is based on the book by John Pearson, The Profession of Violence: The Rise and Fall of the Kray Twins. It centers on the relationship between the two brothers, Reggie's naive wife Francis and their fame in the 1960's. Tom Hardy who plays both brothers is what pulls this film together. His remarkable portrayal of two such diverse individuals is a fascinating study. It's unfortunate the uneven movie takes forever to tell the tale. The Kray's were well known in their London East End neighborhood. In fact the Detective Superintendent Nipper Read (Christopher Eccleston) keeps a constant surveillance on their movements. Reggie even offers them tea while they sit in their car. Ronnie is currently residing in a mental hospital which Reggie manages to “lean” on the psychiatrist to give him a clean bill of health. The doctor advises that Ronnie take his medications to keep his paranoid schizophrenia in check. Ronnie loves the danger and the violence of being a gangster. The more the better. While his brother considers himself a bar owner. At least that is what he tells Francis Shea (Emily Browning) who he meets when she's 16 and married him when she was 22. It's her narration that tells how her attraction to the bad boys was the ruin of her life. It's sometimes hard to get a handle on the thick accents and localisms. Everyone speak like they have cotton in their mouths. Reggie the obvious brains of the two manages to make a deal with American mafia in the casino business and some stolen bearer bonds. Life was good for the brother's during the 60's. They were celebrities with lords and ladies, socialites, show business personalities. When Reggie gets sent back to prison for a spell, Ronnie gets out of hand ruining the bar business and getting involved with a politician in homosexual scandal. Investigations of the Kray's hit the East End “wall of silence” when witnesses refused to testify. The movie tells a more personal story of the brother's complicated family life. As angry as Reggie gets by his brother's psycho episodes, he can't help try and to take care of him. As much as Reggie seems to love Francis and tries to go straight in the business world for their future, he can't help fall back to what he knows best. 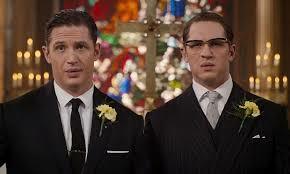 Tom Hardy's Reggie is suave and charismatic, while his Ronnie is mentally unstable without verbal filters. The filmmakers handled their scenes together seamlessly it's hard not to think it's the same actor. The narrative by Francis doesn't seem to work that well as it limits the story to her domestic viewpoint. The uneven film is worth it just to indulge in the amazing work of the up and coming next big thing. Tom Hardy.